Alternatively, you can check the output from the pnputil -e command. Use the following procedure to perform an in-place upgrade of AWS PV drivers, or to upgrade from Citrix PV drivers to AWS PV drivers on Windows Server 2008 R2, Windows Server 2012, Windows Server 2012 R2,Windows Server 2016, or Windows Server 2019. This upgrade is not available for RedHat drivers, or for other versions of Windows Server. If your instance is a domain controller, see Upgrade a Domain Controller (AWS PV Upgrade). The upgrade process for domain controller instances is different than standard editions of Windows. Choose the instance that requires the driver upgrade, open the context (right-click) menu, choose Instance State, and then choose Stop. After the instance is stopped, create a backup. Open the context (right-click) menu for the instance, choose Image, and then choose Create Image. From the context (right-click) menu for the instance, choose Instance State, and then choose Start. Connect to the instance using Remote Desktop and prepare the instance for upgrade. We recommend that you take all non-system disks offline and note any drive letter mappings to the secondary disks in Disk Management before you perform this upgrade. Note that this step is not required if you are performing an in-place update of AWS PV drivers. We also recommend setting non-essential services to Manual start-up in the Services console. Download the latest driver package to the instance. Extract the contents of the folder and then run AWSPVDriverSetup.msi. Verify that the driver version is the same as the latest version listed in the Driver Version History table. For more information, see AWS PV Driver Version History Open Disk Management to review any offline secondary volumes and bring them online corresponding to the drive letters noted in Step 6. If you previously disabled TCP Offloading using Netsh for Citrix PV drivers we recommend that you re-enable this feature after upgrading to AWS PV drivers. TCP Offloading issues with Citrix drivers are not present in the AWS PV drivers. As a result, TCP Offloading provides better performance with AWS PV drivers. If you previously applied a static IP address or DNS configuration to the network interface, you must reapply the static IP address or DNS configuration after upgrading AWS PV drivers. Use the following procedure on a domain controller to perform either an in-place upgrade of AWS PV drivers, or to upgrade from Citrix PV drivers to AWS PV drivers. Before running this command, confirm that you know the DSRM password. You'll need this information so that you can log in to your instance after the upgrade is complete and the instance automatically reboots. The system must boot into DSRM because the upgrade utility removes Citrix PV storage drivers so it can install AWS PV drivers. Therefore we recommend noting any drive letter and folder mappings to the secondary disks in Disk Management. When Citrix PV storage drivers are not present, secondary drives will not be detected. Domain controllers that use an NTDS folder on secondary drives will not boot because the secondary disk will not be detected. After you run this command do not manually reboot the system. The system will be unreachable because Citrix PV drivers do not support DSRM. After running the MSI, the instance automatically reboots and then upgrades the driver. The instance will not be available for up to 15 minutes. After the upgrade is complete and the instance passes both health checks in the Amazon EC2 console, connect to the instance using Remote Desktop. Open Disk Management to review any offline secondary volumes and bring them online corresponding to the drive letters and folder mappings noted in Step 6. You must connect to the instance by specifying the user name in the following format hostname\administrator. 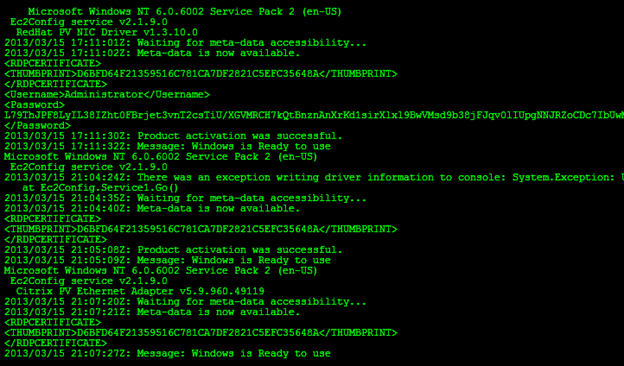 For example, Win2k12TestBox\administrator. To complete the upgrade process, verify that the new driver was installed. In Device Manager, under Storage Controllers, locate AWS PV Storage Host Adapter. Verify that the driver version is the same as the latest version listed in the Driver Version History table. For more information, see AWS PV Driver Version History. Install the latest version of the EC2Config service. For more information, see Installing the Latest Version of EC2Config. If you need to install version 2.0, see Windows Management Framework (Windows PowerShell 2.0, WinRM 2.0, and BITS 4.0) from Microsoft Support. Do not run the Sysprep tool manually or using the EC2Config service. Set your Ethernet adapter to obtain an IP address automatically using DHCP. For more information, see Configure TCP/IP Settings in the Microsoft TechNet Library. Connect to your instance and log in as the local administrator. For more information about connecting to your instance, see Connecting to Your Windows Instance. In your instance, download the Citrix PV upgrade package. Extract the contents of the upgrade package to a location of your choice. Double-click the Upgrade.bat file. If you get a security warning, choose Run. In the Upgrade Drivers dialog box, review the information and choose Yes if you are ready to start the upgrade. In the Red Hat Paravirtualized Xen Drivers for Windows uninstaller dialog box, choose Yes to remove the RedHat software. Your instance will be rebooted. If you do not see the uninstaller dialog box, choose Red Hat Paravirtualize in the Windows taskbar. Check that the instance has rebooted and is ready to be used. On the Instances page, right-click your instance and select Get System Log. The upgrade operations should have restarted the server 3 or 4 times. You can see this in the log file by the number of times Windows is Ready to use is displayed. Connect to your instance and log in as the local administrator. 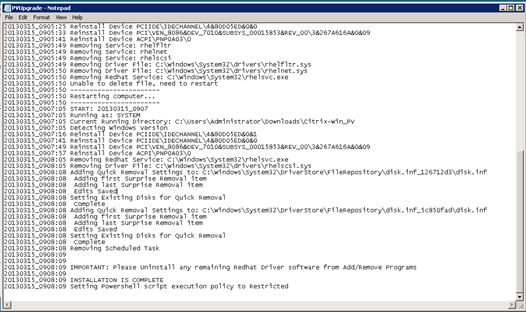 Close the Red Hat Paravirtualized Xen Drivers for Windows uninstaller dialog box. Confirm that the installation is complete. Navigate to the Citrix-WIN_PV folder that you extracted earlier, open the PVUpgrade.log file, and then check for the text INSTALLATION IS COMPLETE. If you are using Citrix PV drivers on Windows Server, you can upgrade the Citrix Xen guest agent service. This Windows service handles tasks such as shutdown and restart events from the API. You can run this upgrade package on any version of Windows Server, as long as the instance is running Citrix PV drivers. For Windows Server 2008 R2 and later, we recommend you upgrade to AWS PV drivers that include the Guest Agent update. Do not enable the Sysprep tool in the EC2Config service. Set your Ethernet adapter to DHCP. On your instance, download the Citrix upgrade package. When the upgrade is complete, the PVUpgrade.log file will open and contain the text UPGRADE IS COMPLETE.